The perfect solution for patio doors and large window runs, our Bi-fold and By-pass Tracking Systems are ideally suited to long panel runs and are also suitable for room dividers and partitions. Ideal for ground level windows and town houses, Café style leaves the top of the window un-shuttered, using only shutters for the bottom part. This style maximizes light whilst providing privacy. Independent panels top and bottom give greater adjustability to make the most of light, the view or provide you with privacy. Covering the full height of the window, this is our most popular and flexible installation style. Commonly specified with a mid-rail, the shutter panels are split into sections, with separate tilt rods, providing the highest levels of privacy and light control. Solid shutters have been used in the UK and Ireland for more than 200 years and provide a more traditional finish to dressing your window. Added benefits are that solid shutters offer near blackout and also provide high levels of noise insulation and perceived security. Plantation shutters have always been one of the most stylish ways to dress French doors and other doors with glass inserts. These wooden shutters are manufactured so that they are fitted directly onto the door frame so that unlike other window coverings they do not get in the way when the door is opened or closed. In addition we are able to manufacture the shutter so that the existing door furniture is unobstructed and functional. Even the most unusual window shutter shapes can be catered for within the S:CRAFT range. 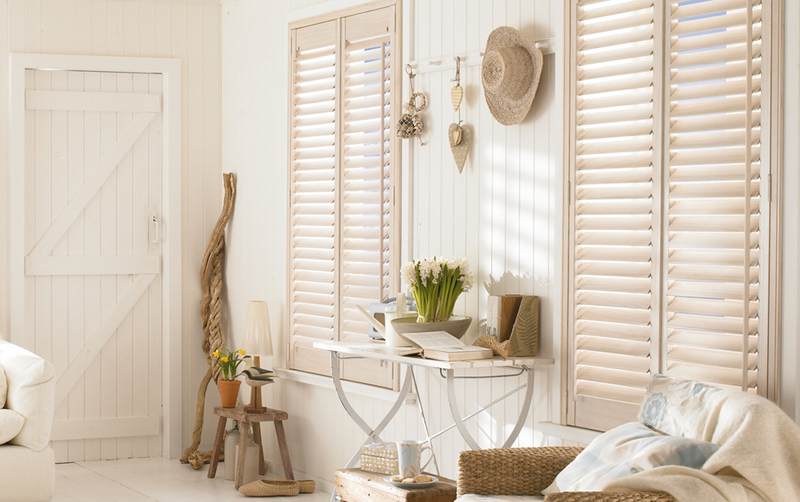 We have extensive experience in manufacturing bespoke interior shutters for radius, arched or angled windows. Due to their bespoke nature special shaped shutters can only be manufactured in hardwoods and require a large amount of additional manual input by our master joiners. A quintessential European window styling that until the introduction of internal plantation shutters was limited in the way it could be dressed. S:CRAFT can offer you the best in window dressing solutions for Bays, providing the flexibility to show off your feature to the full. We can provide a custom bay post solution that provides an all-in-one frame that fits around your bay or you can opt for individual frames for each window.